Go to the SharePoint list where you have adjusted Lookup Cross-Site selector columns and click “New”. We have created three lookup fields with the dependence country -> city-> client. This means that when a user adds new item to the list, he selects country and the list of cities of this country will be displayed accordingly. And when the list of cities is defined, the same happens with clients list. Enter title of the lookup and start typing country name. The list of countries will be displayed. 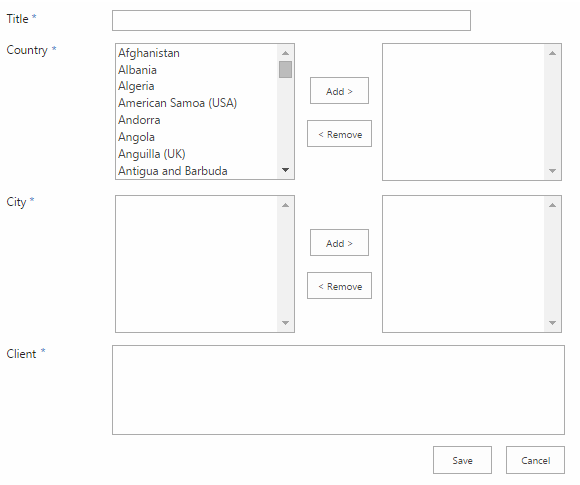 Click on the required country and use arrow button to add this country to the lookup. As you add countries to the lookup, the list of cities changes accordingly. 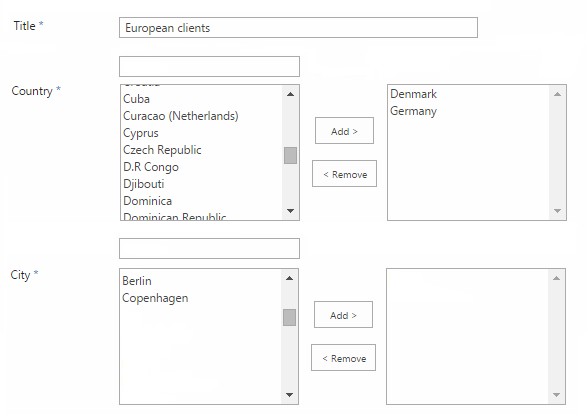 And as you select cities, the list of clients changes as well. Click “OK” to create lookup. You can view the list item to see the details. Pay attention, if you defined additional field to be displayed (see the previous section), these fields will be displayed in the list item view mode. This way you can create lookups and set references between SharePoint list columns.